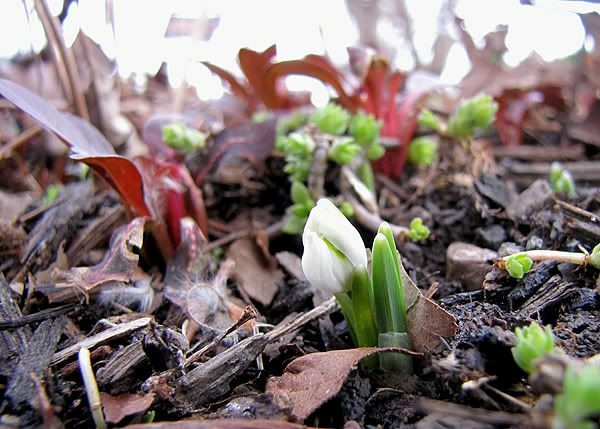 As we get teased by the warmer days of early spring - only to get chills from lingering cold days - we wander about in our gardens, looking for signs of life. 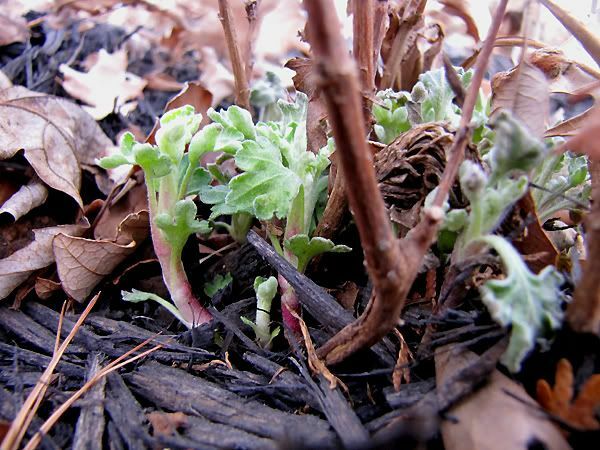 We know they're there, hiding under the mulch and dead leaves, but we impatiently want to see them. Faith wears thin right about now. But look closely, and pay attention to the indirect signs that spring is happening right under our noses. Look even closer and it's unmistakable. One of those signs is heaving. Unless you live in a climate where the ground goes through a freeze/thaw cycle, you likely don't experience this in your gardens. But to us northerners, it's all too familiar. And just what heaves? 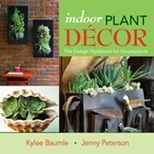 Plants, bulbs, plant markers, stepping stones. As the ground freezes, it expands due to the moisture contained in it. (Think of what happens to a can of pop when you leave it in the freezer too long.) As spring begins to take hold, the frozen ground thaws a bit on warmer days, then refreezes on the colder ones. Plants such as Heucheras eventually end up with their crowns rising out of the ground. When I was walking out through the gardens today, enjoying the 63°F temperature, I noticed some heaving had occurred. Iris rhizomes reminded me of crayfish tiptoeing through the mud. It seems to me, that except for the root exposure, this could serve the irises quite well. Spring brings heavy rains and we know if irises are planted too deeply, they'll rot. 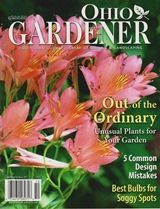 However, for most plants and bulbs, heaving can mean death to the plant if the unprotected roots are continually exposed to the elements. 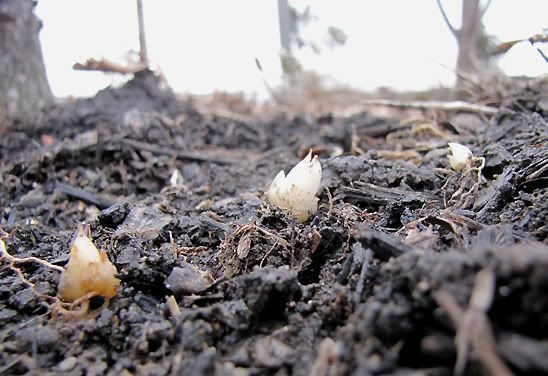 Lily bulblets lie close to the surface and can become exposed as spring approaches. 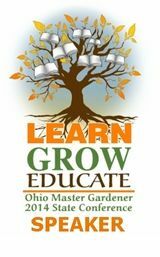 One of the best ways to prevent winter heaving is to make sure plants are mulched well. 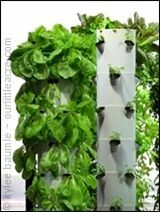 This insulates the ground from wide fluctuations in temperature. Another important preventative is to provide good drainage. The more moisture that's retained in the ground, the more you'll experience heaving. 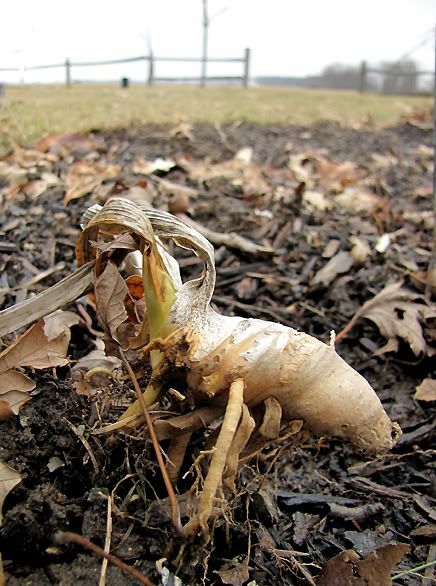 When you see a plant or bulb that's risen out of the ground, you can gently press it back into the soft ground. 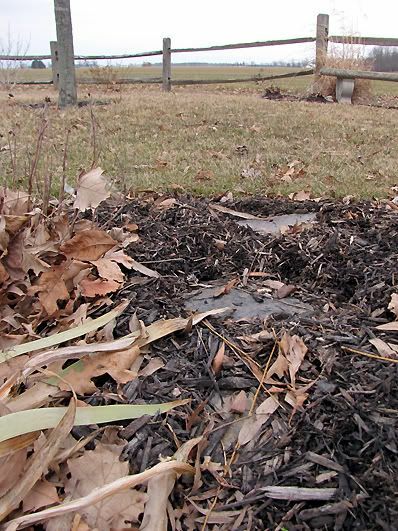 If the ground is still frozen, just mound some mulch around the roots until you are able to coax them back down. I continued my walk and noticed the mums had new growth around the base of the old plants. 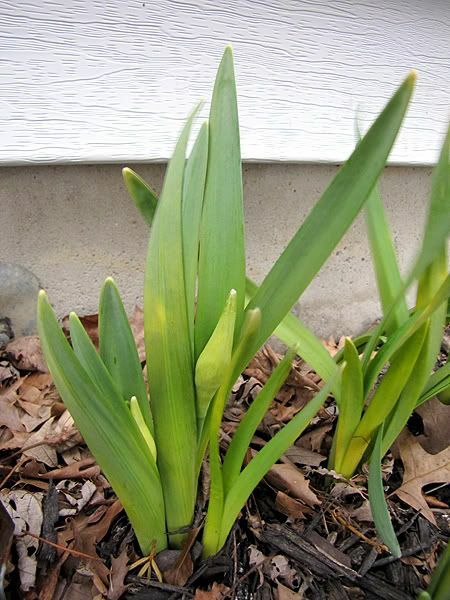 The daffodils (Narcissus hybrid) on the south side of the house are continuing to grow taller and now have flower buds! 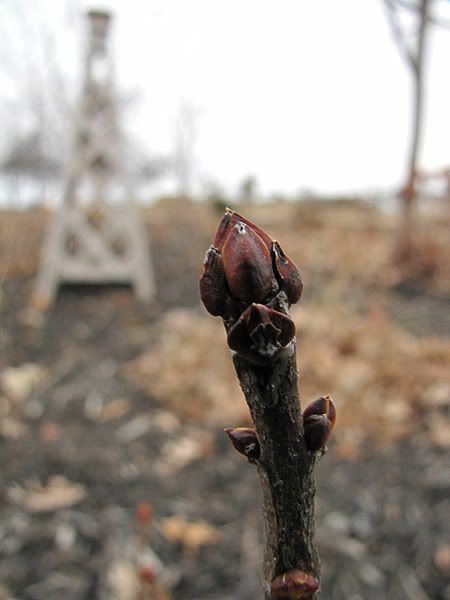 'Sensation' Lilac (Syringa vulgaris) has swelling buds. The white Peolac has them, too. A snowdrop! It almost looks as if it's in such a hurry to bloom that it can't wait to grow up a little bit more. With warm temperatures in the 60s expected for the next few days, I think we'll see a lot of changes in the gardens. Maybe the witch hazel will even open up and bloom! "March is the month of expectation." Spring is coming to Ohio, no doubt about it. Oh yes. It IS good to see those small signs of spring. I was working in the garden yesterday. My soil is very rich and thick (had it hauled in) and so, I did have some heaving around perennials and seeds that were planted in the fall. The soil was workable, so I was able to put them back in place. A warm weekend for NC after Monday's cold snow! Kylee, I love the fresh spring-like look of your blog. March is full of expectations. I got out in the garden yesterday and did a little work. I do mean to say little and I am sore today. This is also a sign of spring. tee hee.. 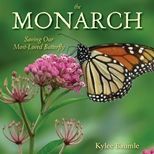 I'm very familiar with heaving Kylee, and this informative post serves as a reminder for me to do some investigative work. I usually find a few things that need tamped back down, but like you said, mulching is a big help. We have rain movin in now and over the weekend, but I might be able to do a quick walk around here in a few. Have a great weekend! The "month of expectation" indeed! What a perfect description. Funny, I noticed just yesterday that a couple of my heucheras had heaved just a bit. I planted them in the fall, so they didn't have a lot of time to connect to the earth. Love the iris "crayfish"! What a fun image. He looks ready to crawl away in search of sunshine! I always read about heaving but we don't get much of that here. It is fun seeing signs of life isn't it? We are having some unseasonably warm weather here. 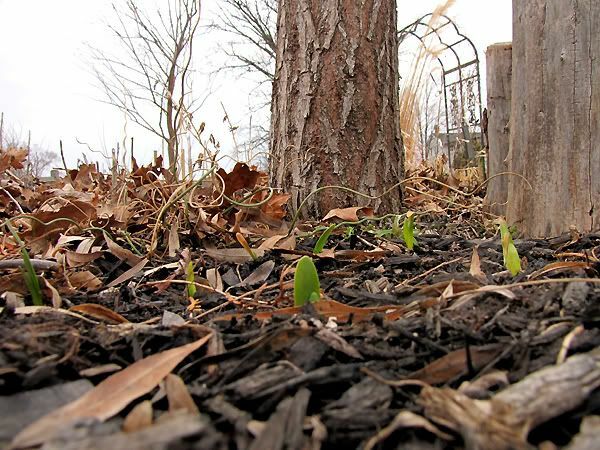 My gardens are all heavily mulched so I don't expect to see signs of life before April. How exciting! I spent the day outside working yesterday enjoying the lovely weather. Yes it looks like spring is coming to Ohio. Spring keeps teasing us here in Southwest Missouri. Warm days, but yesterday we had 25-30mph winds, with 40mph gusts. Didn't see many birds flying. I am very ready to dig in the dirt, and after 3 wonderful days of sunshine, its suppose to rain all weekend. Such is my luck. I can imagine neither heaving nor frozen ground, having always lived south of the Mason-Dixon line. But your pic of the iris sure does look like a crawfish! yep, I was out there for a bit yesterday looking for signs of life, and found a whole lotta heavin' goin' on here too, especially stuff that went into the ground late last fall. Looks like you've got a whole lotta growin' goin' on in your garden too Kylee! So exciting seeing new shoots! I've heard of heaving, but have never seen what it actually looks like. At least you have lots of signs of spring that are good, 63 sounds so warm. 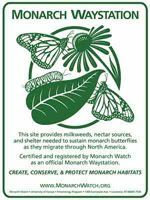 Have fun finding more spring in your garden! too, don't you just love it! Kim and Victoria ~ Amazing how good it makes us feel to see that, isn't it? Glad you were able to work in your garden! Lisa ~ Thank you! I was ready for something a little more sunshiny! I worked outside for about five hours today and I KNOW I'll pay for it tomorrow. But it felt good to be out there doing it! TC ~ I spent quite a bit of time out in the gardens today and it was wonderful! We're to get rain this weekend, too. Donna ~ I'm not sure it makes a difference when you plant those heucheras. I've had some in the ground for several years and they still manage to heave a bit. They're just prone to it! Phillip ~ It sure is! I had a good time outside today, looking for more signs! Catherine ~ It was even warmer today and I'm lovin' it! Cathy ~ Thanks, Cathy! Oh, yes, I do love this time of year, for sure! Kylee, You are having a wonderful array of things to photograph. I had to laugh at that iris rhizome! :-) It DID look like a crayfish. Kylee, Your new Spring-y header makes me feel the need to change mine! :-) Very pretty! Shady Gardener ~ What I generally do about the heaving heucheras is to get extra soil and mound it around it until we are well into the growing season. Then I dig it up and reset it. I've lost a couple of heucheras over the years, but I don't know that it was due to heaving. Pam ~ The heaving is common here. I was back out there today and saw other things heaving - especially the blackberry lilies. Geez, those things were nearly all the way out of the ground! Rick ~ I hope you got to dig in the dirt at least a little bit! I was back out there today, cleaning yet more leaves out of the beds.